124 pages | 25 B/W Illus. 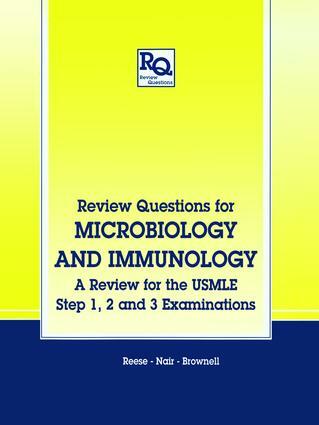 This is a review text on medical microbiology and immunology containing approximately 625 board-type review questions on left-hand pages with answers and explanations on facing right-hand pages. It is designed for medical students taking microbiology as well as for those studying for Step 1 of the National Board Exams and is also useful for Step 3 National Boards on infectious diseases or allergy and immunology. The book's main sections cover general and medical microbiology, bacteriology, virology, immunology, and parasitology. The answers summarize relevant information and point out the fault in incorrect answers. Line drawings and figures are used for questions concerning structure of both molecules and organisms and for interpreting graphical results. Authors Reese, Brownell, and Nair, all with the Medical College of Georgia, bring a combined total of some 85 years of medical school teaching experience to their development of the questions and annotated answers for this book. General immunology: non-specific host defenses, complement, antigen binding molecules, lymphocytes and lymphoid tissues, lymphocyte maturation, antigens and tests for antigens and antibodies, cellular control of immune responses, cytokines and hormones. Clinical immunology: effector functions of the immune system, immune deficiencies, immunopathology, autoimmunity, immunobiology of cancer, immunobiology of transplantation, intervention in the immune response. General virology: virus structure, growth, assay and inactivation, viral replication, viral transmission and viral persistence, antiviral immune responses, viral genetics. Clinical virology: enteric viruses and hepatitis viruses, respiratory viruses, neurotropic viruses, herpes viruses, retroviruses. Microbiology: general microbiology, morphology, growth characteristics, antimicrobial agents, bacterial genetics, pathogenic bacteria, mycology, parasitology.